Ola Hoglund and Marie Simberg-Hoglund have worked together as a team for more than four decades to create glass artwork that has earned them world-wide praise. Ola Hoglund and Marie Simberg-Hoglund have worked together as a team for more than four decades to create glass artwork that has earned them world-wide praise. Partners in life as well as design, their artglass is internationally renowned and sought after by both public and private collectors worldwide. They have exhibited in more than 40 international exhibitions in New Zealand, Australia, Germany, Sweden, Denmark, the US, Hong Kong, Singapore, Thailand, Dubai, Indonesia, Taipei and Japan. From 1978 to 1981 Ola and Marie spent three years in Swaziland (Africa) establishing Ngwenya Glassblowing Studio as a Swedish government development project. In 1982 they moved to New Zealand, choosing to become citizens. Today they share their time between New Zealand and Australia. 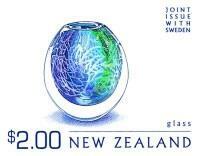 In 2000 and 2003, Höglund Art Glass was appointed to produce the Official Team New Zealand and America’s Cup art glass. The success in 2000 led to the next prestigious invitation; to create the art glass for the Sydney 2000 Olympic Games – The Games of the New Millennium. Ola and Marie designed a collection of bright and colourful art glass for this exciting event. They also created ‘Athletes in Motion’ – a limited edition of one-off Graal pieces, capturing the strong, graceful movements of athletes between several layers of heavy, crystal glass. These unique pieces celebrated the strength and agility of the athletic human body when in competition with the best sports people in the world. 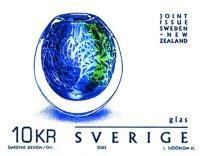 In May 2002, New Zealand Post and the Royal Sweden Post released a joint stamp issue – Art meets Craft. Each stamp featured a Rainforest Graal vase designed and made by Ola Höglund and Marie Simberg-Höglund. Two eye catching First Day covers accompany the stamps. The artistry displayed in the stamps lead to the issue becoming one of the few prestigious Limited Editions created by New Zealand Post each year. Only 2,000 of the editions will ever be produced and were sold before the release.